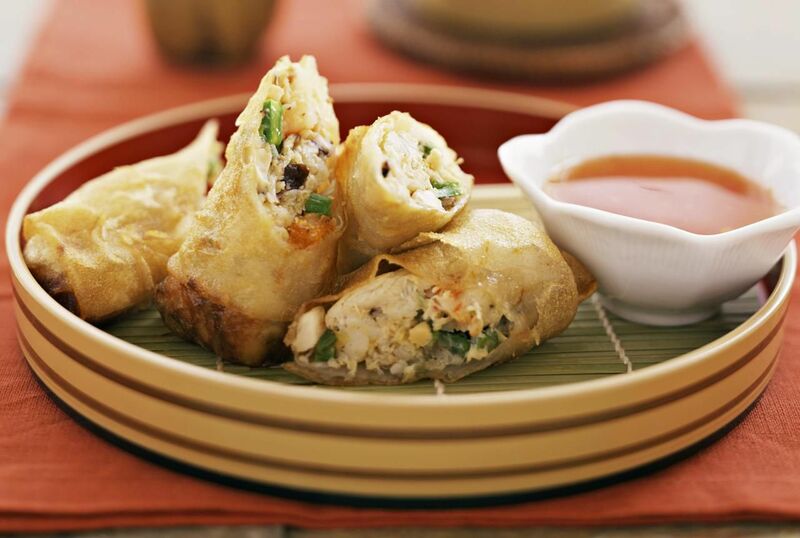 These Thai spring roll recipes make great springtime appetizers. From classic spring rolls to fresh rolls, including vegetarian and gluten-free options, these recipes are as good or better than the spring rolls you have had at restaurants As an added bonus, they are fresher and healthier, too. If you need to brush up on your rolling technique or have never made a spring roll, learn how to roll spring roll wrappers with step-by-step instructions. This Thai spring roll recipe can be made vegetarian with tofu or with baby shrimp if you prefer. Brimming with vegetables and lots of flavor, these spring rolls make a great springtime appetizer or party food. And they're surprisingly easy to put together. Get some help from your children or guests with the rolling, and you'll be enjoying these spring rolls in no time! The vegetables—including garlic, onion, cabbage, and mushrooms—are first stir-fried in a tangy sauce made of soy sauce, fish sauce, lime juice, and sugar. After assembling and folding the rolls, you gently fry them until crispy. They are delicious served with Thai sweet chili sauce. These rolls are named "fresh" for a reason. Ingredients such as shrimp, bean sprouts, herbs, and carrots are rolled inside gluten-free rice wrappers and are eaten "raw"—instead of deep fried—to enjoy all of the ingredients' freshness and flavors. This easy Thai recipe is quick to put together, and can also be made vegetarian. Fresh spring rolls make a great finger food for parties and potlucks, or you can serve Thai fresh rolls as part of the main course. As a bonus, these fresh rolls are very healthy, as they are low in both calories and fat. This egg roll recipe is crunchy, delicious and super-easy to make! The egg roll filling is made up of lots of crisp vegetables plus a little egg, making this recipe a great choice for vegetarian food fans (vegan instructions also included). Get your friends or family to help with rolling them up—it is fun to do! Even if you are making them solo, you'll find these egg rolls quick and easy to put together. These rolls are excellent as an appetizer or as part of a complete meal—just pair with a Thai salad or a noodle dish and enjoy! Try these delicious vegan tofu spring rolls; they're a great vegetarian option to other spring roll recipes. The tofu provides extra protein without using any animal source. For a great springtime appetizer or as part of the main course, try this Thai fresh roll recipe. Unlike most fresh rolls, these contain a warm filling made with black bean and garlic sauce and strips of beef or vegetarian wheat gluten. This delicious recipe is so easy to make, you will want to keep it close at hand, both for ​everyday use as well as special occasions.